(CNN) -- A U.S. Border Patrol agent who was shot and killed Thursday night was responding to a potential incursion into the United States, authorities said. U.S. 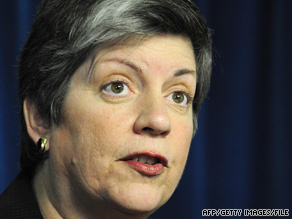 Homeland Security Secretary Janet Napolitano says, "This act of violence will not stand." Agent Robert Rosas suffered multiple gunshot wounds and died at the scene around 9 p.m. in the Campo area in San Diego County, California, said Richard Barlow of the U.S. Border Patrol. Barlow, speaking at a Friday news conference, said authorities did not have additional details about the incident, which he said occurred near the fence that separates the U.S. and Mexico. Other agents responded to the area and found Rosas, Barlow said. Authorities weren't sure how the person's wound was caused but said they believe it was significant enough to draw blood, Slotter said. He said the FBI has set up a $100,000 reward for information leading to the arrest and conviction of those responsible for the killing. U.S. authorities are working closely with Mexican authorities, he said. Barlow said Rosas leaves behind a wife and two small children -- a 2-year-old son and an 11-month-old daughter. The slain agent had been with the Border Patrol for three years, Barlow said. Homeland Security Secretary Janet Napolitano vowed to "find and bring to justice" those responsible for the killing. "This act of violence will not stand -- nor will any act of violence against the Border Patrol," she said in a written statement. Rosas is the ninth Border Patrol agent to be killed while on duty since 2006, according to the agency's Web site. Two agents died in a vehicle wreck in 2006, and four died in 2007, including two who died in vehicle wrecks, a third who drowned and a fourth who suffered a heart attack while pursuing illegal immigrants. Two agents died on duty last year, the Border Patrol said. One died in a single-vehicle wreck; another was struck and killed by a vehicle driven by a suspected smuggler, according to the agency's Web site.